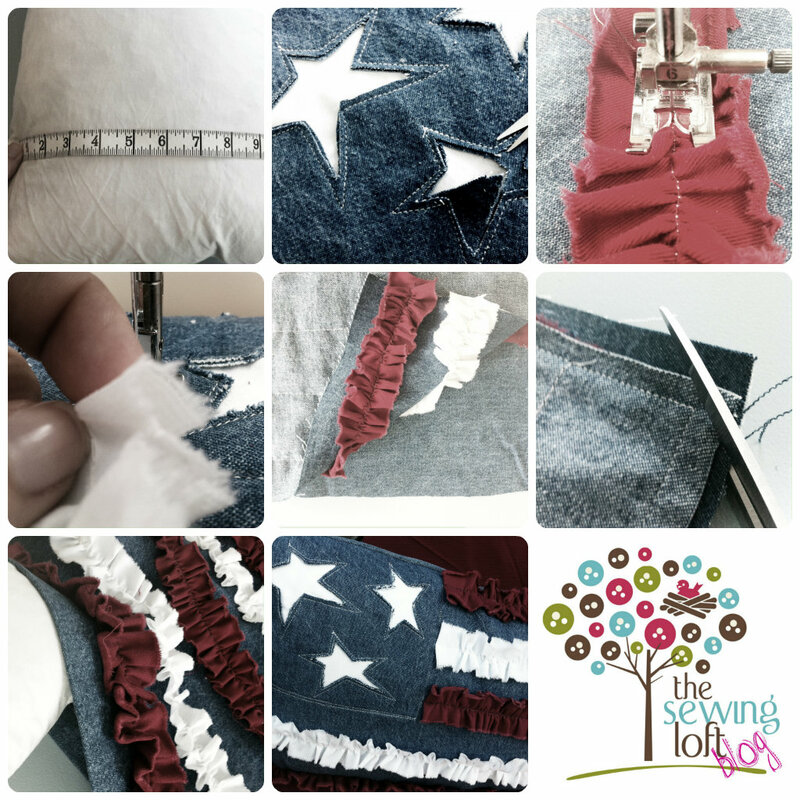 Last week, I shared a sewing technique for creating a Reverse Applique. Today, is all about finishing the project. 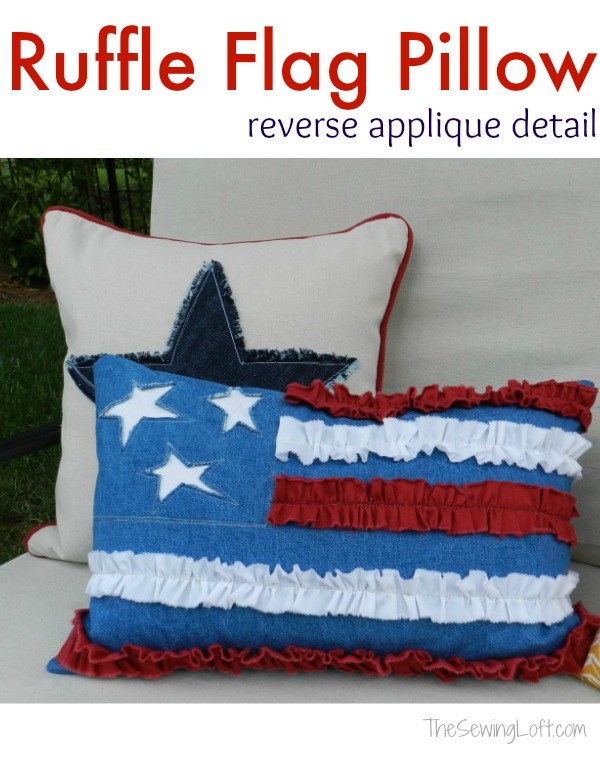 This ruffle flag pillow is the perfect way to freshen up my outdoor space and summer naps in the sun! I created my stars in the upper left corner using the Reverse Applique technique. To create the stripes, I alternated ripped strips of white and red fabric 1 3/4″ wide. Using a straight stitch on the longest setting, I stitched down the center of each strip leaving long tails of thread on each end. To gather the ruffles, I pulled the top thread from each side and “scrunched” to length. Pin ruffles in place and attach with a standard straight stitch in matching thread color. To keep things neat, I folded under each end. Continue as needed to achieve design. Sandwich front and back of pillow cover; right sides together. Starting at one side, straight stitch all around pillow; leaving enough room to insert pillow form. Clip corners; turn right side out; press and insert form. Slip stitch closed with needle and thread. Perfect for the summer ahead! ps- If you “spied” that star pillow in the background and want to make it- click here. Another great way to connect with me is via Facebook, Pinterest, Twitter and Google+. I’m looking forward to getting to know you and creating together! so cute! Perfect for 4th of July! Love this pillow – reverse applique and ruffles are just brilliant! This is great! I hope you will link up to my Patriotic Project Parade! Have you heard about our Craftastic Competition? I’d love for you to enter in it! Lots of prizes to be won too! Very cute!! I LOVE the ruffles. Thanks for sharing this at Romance on a dime!! Pinning this. Your new page looks amazing!! I featured you today~ for 4th of July!